That was already bad enough though not damaging: what was downright stupid was to pick on Diego Arria while unprovoked into. Even more, Capriles went to count Arria's tweets.... I mean, if Capriles is such a leader, why should he lower himself to count the tweets of someone he clearly despises? Is that "statesman" like? But if Capriles keeps disappointing me by his poor sense of timing, apparently being little more than a campaign machine where he excels, mercifully, it may not matter much in the end. The Unidad/MUD revived today and offer a 12 step program (I kid you not). 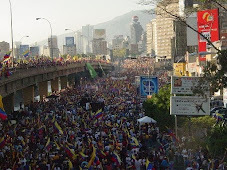 The 23 de enero celebration of the MUD was a powerful way to relaunch its comatose self and Aveledo gave a good, encouraging speech which in addition of offering what is in reality a transition program, also assured us that the next candidate of the MUD to face Maduro will be swiftly chosen by consensus. No details on that but from what different leaders were saying in recent days it seems that they mean it. Tuition Tutor! The spam is becoming more diverse every day! Great blogging lately, btw, Daniel. Maybe I am inspired by all the spam that I have to delete? LOL, erase away, my friend. 2. Agree that the MUD needs re-encauchamiento. And the 12-step jig shows thought process to revive an almost moribund coalition. 3. Agree that PJ is not a robust party with a well-coordinated strategy and execution. I have long thought that it's too full of altar boys whose vision for the country is not focused. 5. Agree with jsb: great blogging lately, Daniel. P.S. That panorama interviewer had absolutely no interest in her subject. The audio clip made her sound like she was half-assed listening while painting her nails, her boredom proof of a limited intellectual resource. Can't recall any previous debate having a moderator that was as obviously bored and disinterested as was the twit that *listened* to Capriles in this instance. I hope you get to hear the audio sometime. It was pitiful. Perhaps Capriles is more critical of Diego A. than he is of Chavez himself which is apparently what " the people" like which is why they have supported him.I mean his 'comeflorness', and all is just amazingly admired, in the general sense, but I never shared that admiration.I believe in staying true to my values through thick and thin. All these years the " opposition" has been kowtowing to the very mechanism that keeps Chavismo in power.